Every tooth and molar have one or more nerve channels. Dentists call this pulp. The pulp is living tissue and consists of nerve fibres and blood vessels. 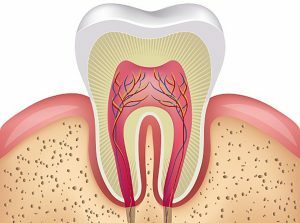 The nerve canal can become inflamed, which has consequences for the tooth or molar, but also for the jawbone. Once inflamed, the tooth can be painful or can become sensitive to cold and heat. A tooth or molar can also change colour. It is necessary for the root canal to be cleaned and then filled up again, so that bacteria are killed and no longer have a chance to proliferate. Diagnosis and treatment of nerve channels are performed by our specialist dentist, who has been specialising in this field for many years. Everything will be examined closely and treated with the most modern equipment and techniques.